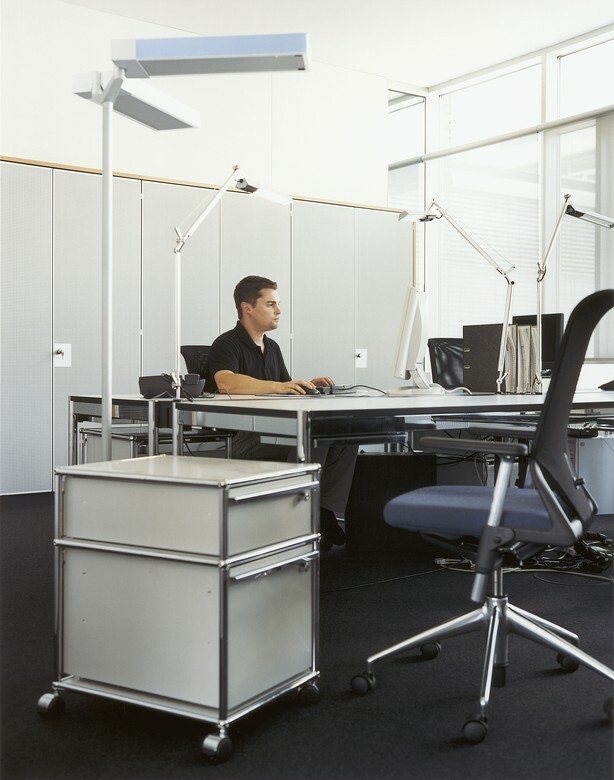 Characteristic of USM office furniture, including the USM mobile pedestal, is the uncompromising realisation of a function oriented approach. USM Haller is a modular furniture system that allows by means of a simple, basic, structure complex interior design solutions. 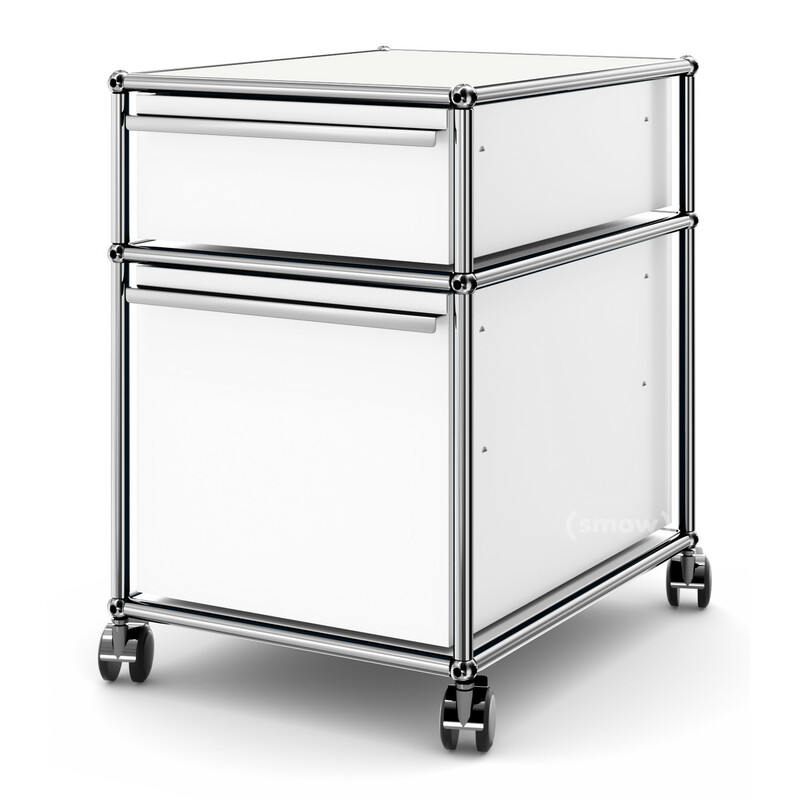 The practical USM mobile pedestal fits perfectly into this design philosophy and ably demonstrates the possibilities contained within the Swiss design classic. Must I purchase an additional support frame for suspension files? No. 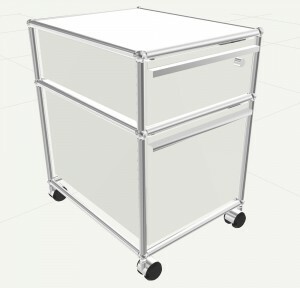 All necessary fittings are already integrated in the mobile cabinet. Can commercially available suspension folders be used or must one purchase special USM folders? Commercially available suspension folders can be used. USM do however also offer their own suspension folders. Is it the mobile cabinet available in a different depths? 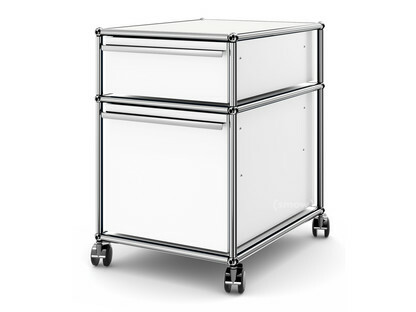 The mobile cabinet can only be purchased in the 500mm depth, as the necessary type of drawer, although at different heights, is only in this one depth. 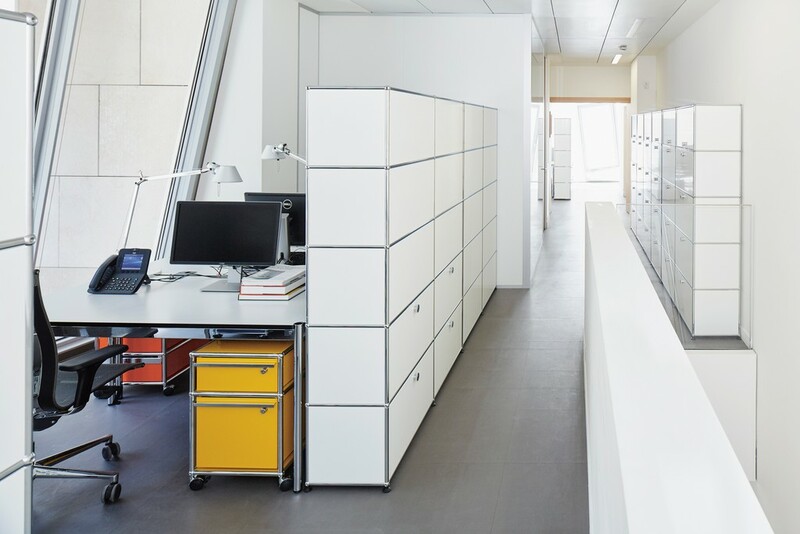 The USM Haller shelving system was developed in the 1960s in the Swiss town of Münsingen, and to date is still largely produced there. 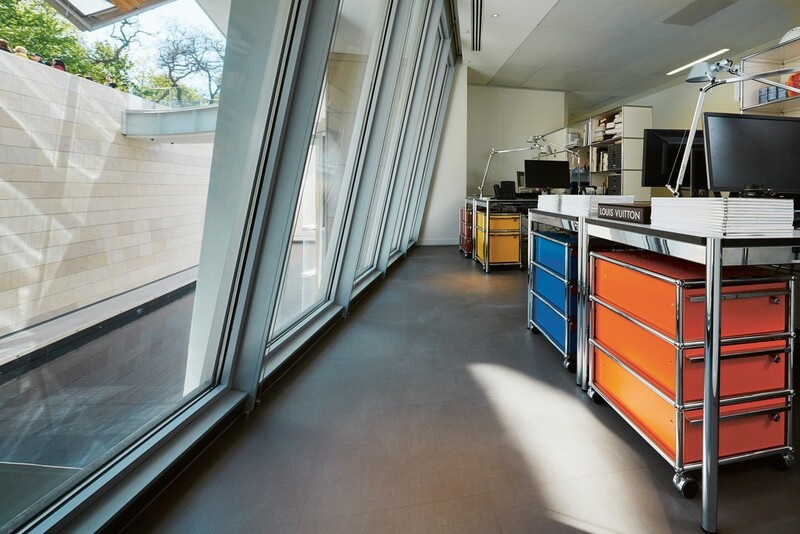 All USM basic building blocks are produced in Münsingen where the metal shelves are also power coated in one of the 14 standard USM colours. Components intended for the German market are then taking the USM base in Bühl, Baden-Württemberg where the final assembly occurs. Well of aware of its environmental and social responsibilities USM Haller produce all components in as environmentally justifiable a way as possible; among the foci of the company are energy resource reduction, water efficiency and reducing CO2 emissions caused by transport and distribution. 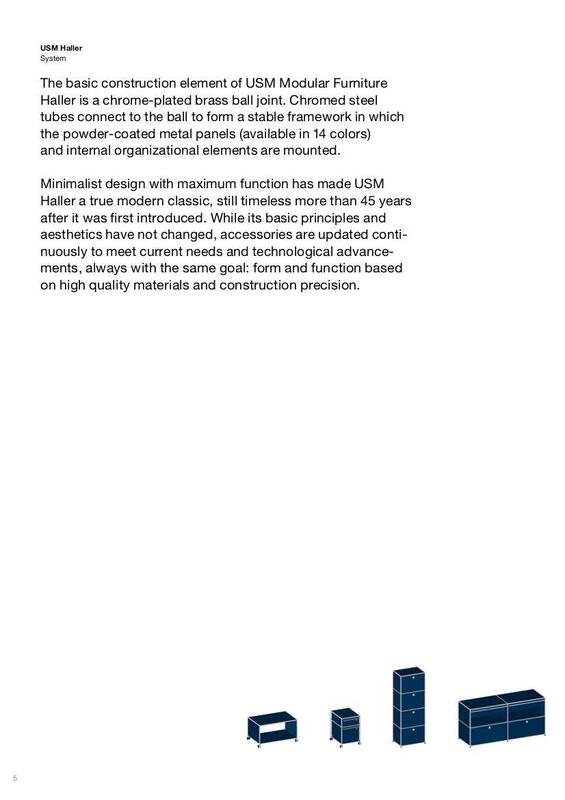 The greatest contribution to the sustainability of USM Haller products comes however from the design: a very long product life cycle through high quality materials and its flexible modular nature meaning a USM Haller unit need never be replaced. 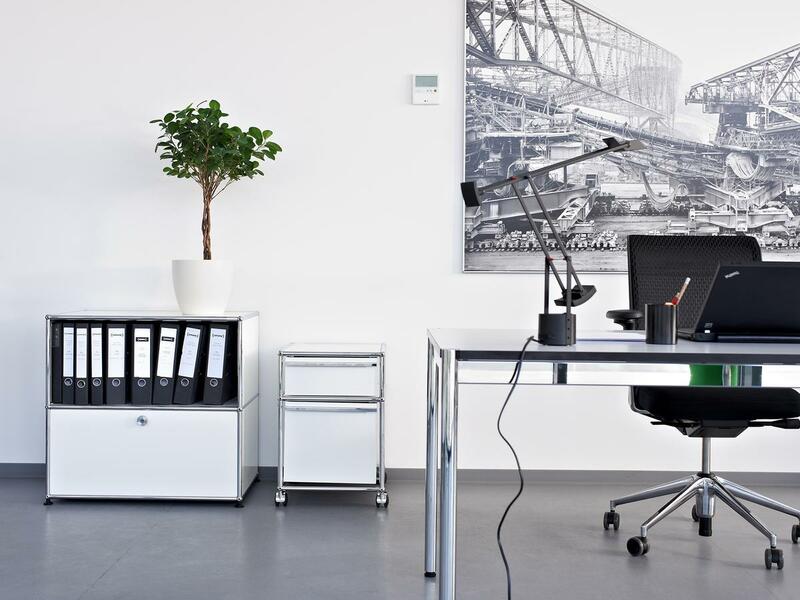 In addition the USM furniture was awarded the Greenguard Indoor Air Quality Certificate, a guarantee of low emission products and thus a healthier indoor environment. 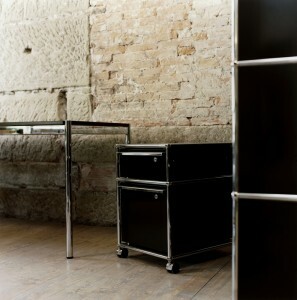 Eponym for the USM Haller modular furniture system is the designer Fritz Haller. 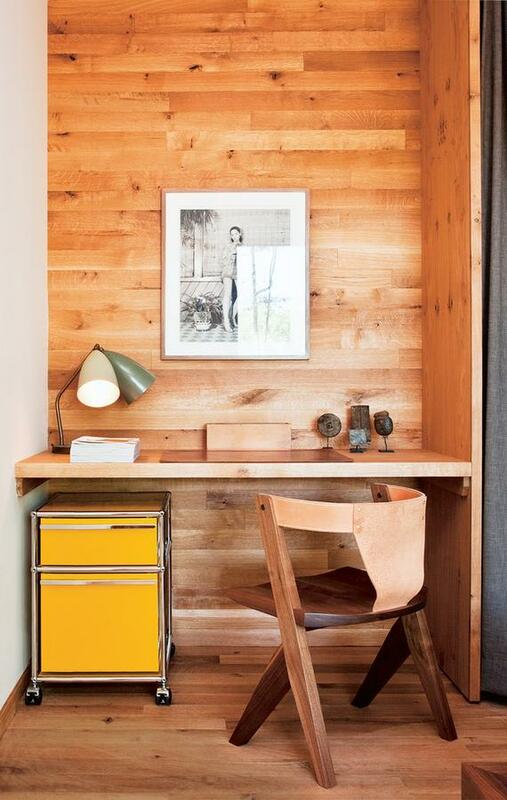 Born in Solothurn, Switzerland on October 23, 1924 Fritz Haller was actually an architect and the USM shelving represents his only serious venture into furniture design. However as with so many "Furniture Architects" in this case a bridge can also be constructed between the two design disciplines. As a red line running through Fritz Haller's oeuvre is systematization through modular objects. 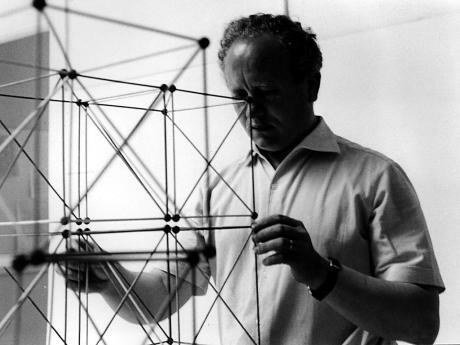 Just as with the USM modular furniture system Fritz Haller also developed his MidiMiniMaxi construction system, a system that used the same basic principles of three different scales to create three different types of building. 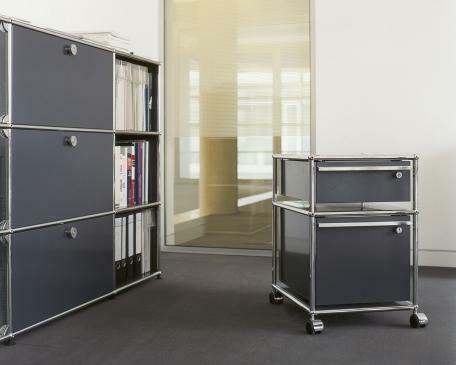 the USM Haller modular furniture system can be considered a fourth form. The furniture itself arose from a 1963 commission to furnish an office pavilion he had constructed for USM in Münsingen. Fritz Haller died in 2012 in his native Solothurn. The USM Haller story begins in 1885 with the establishment of an ironmongery and locksmithing business by Ulrich Schärer. His successor in the second generation, Paul Schärer, commissioned Fritz Haller in 1961 with the planning and construction of new premises for USM in the Thunstraße in Münsingen. 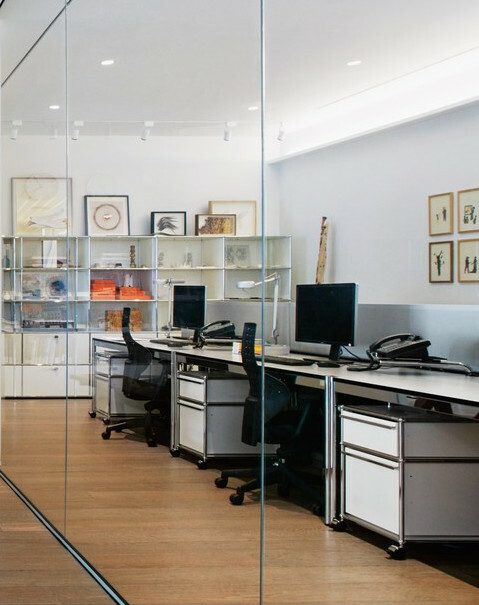 As part of the commission order Haller was also requested to design a shelving system tailored to the company. 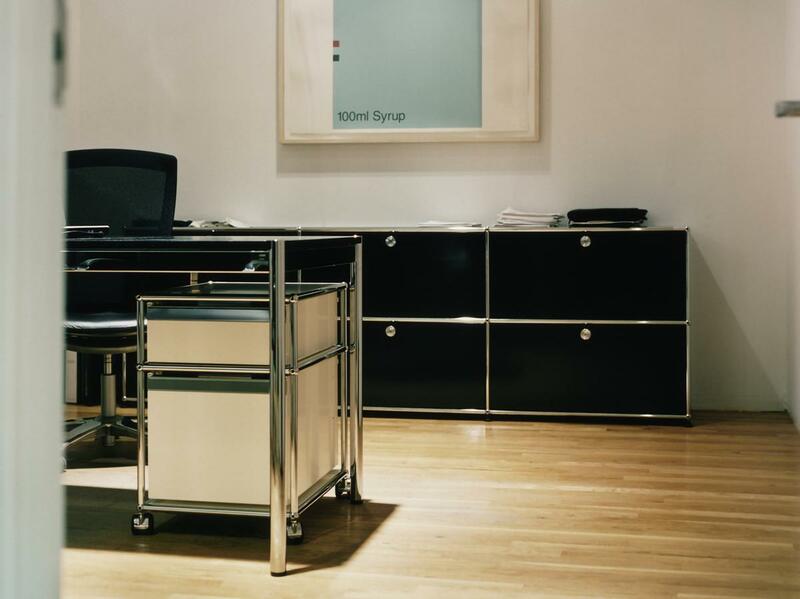 Since 1988 the USM Haller modular furniture system has been protected by copyright, and in 2001was included in the collection of the New York Museum of Modern Art. 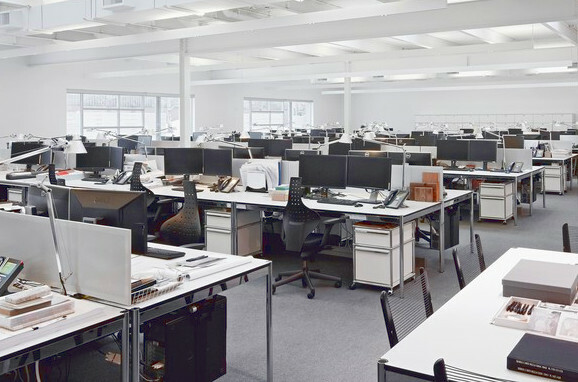 In 1992 USM ceased production of all other product lines, notably the window fittings on which the initial success was based and now focus exclusively on the development and production of its furniture system. 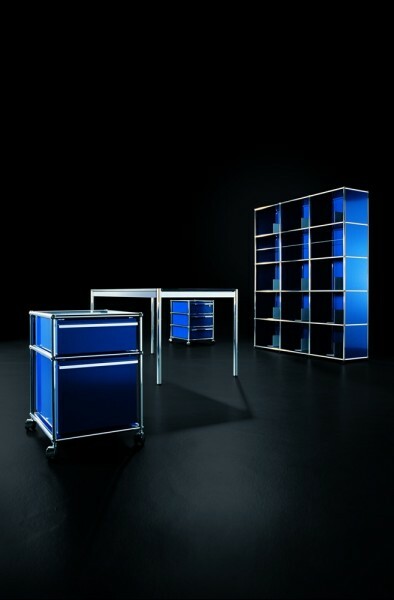 A furniture system that in addition to the familiar sideboards, highboards, mobile cabinets, tables et al also special, technical, solutions, and bedside tables. 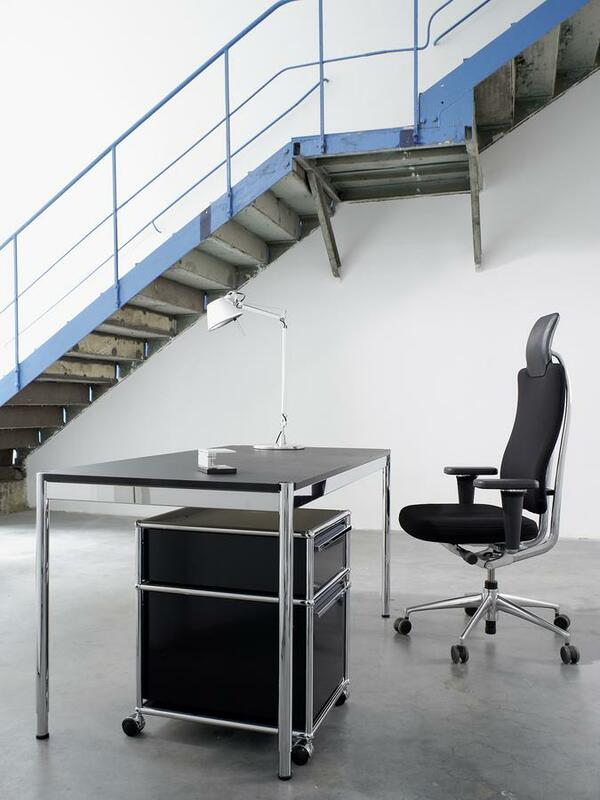 Characteristic of the USM office furniture system is the uncompromising implementation of a function-oriented approach. USM Haller is a modular furniture system that can create complex furnishing solutions by means of a simple basic structure: metal tubes built the skeleton, shelves serve as cladding while small chrome plated brass balls connect the whole. This simply construction principle can produce objects as varied as the the classic USM Haller sideboard or USM mobile cabinets. 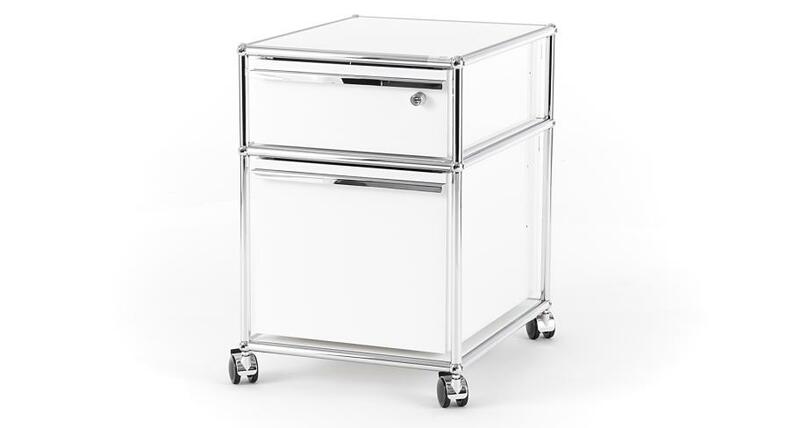 The USM Haller trolley suspension filing cabinet features two drawers, the larger including an insert for suspension files. 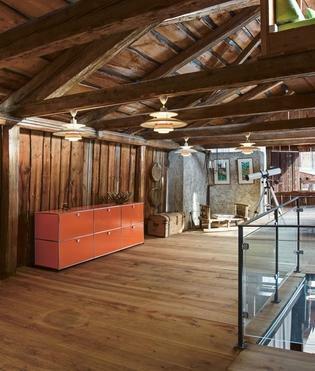 Despite the clear focus on functional solutions with USM a stylish, elegant interior is always guaranteed. 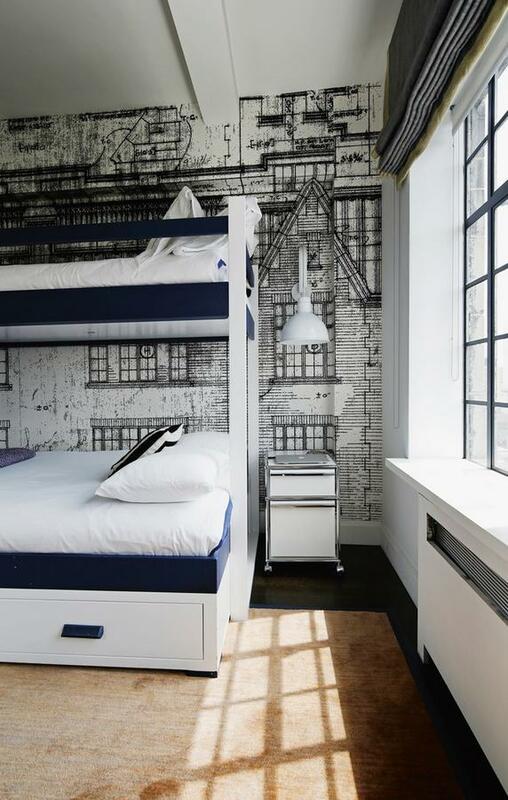 Originally developed for the company's own internal use, since the 1970s USM has grown in popularity and today is a much loved and admired international favourite. 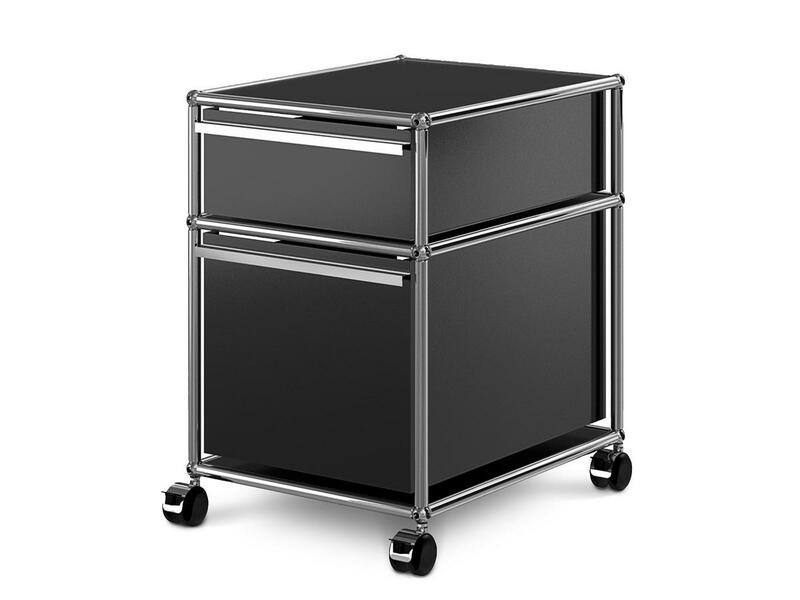 When looking to place the USM Haller mobile cabinet into the history of furniture, one comes, inevitably, to the famous quote "form follows function". Coined in 1896 by the American skyscraper architect Louis Sullivan the motto quickly became a clarion call for a new generation of architects and designers. Although often misunderstood as a call for plain or purely functional architecture, the intention is far more about making the shape of an object reflect and support its function. USM, which offers individual solutions for various requirements, meets this requirement perfectly. Typical of functionalist objects of the 1960s the USM Haller modular furniture system is a timeless design which can be enjoyed today as it could back at its inception. And more importantly which will still be being enjoyed in generations to come. 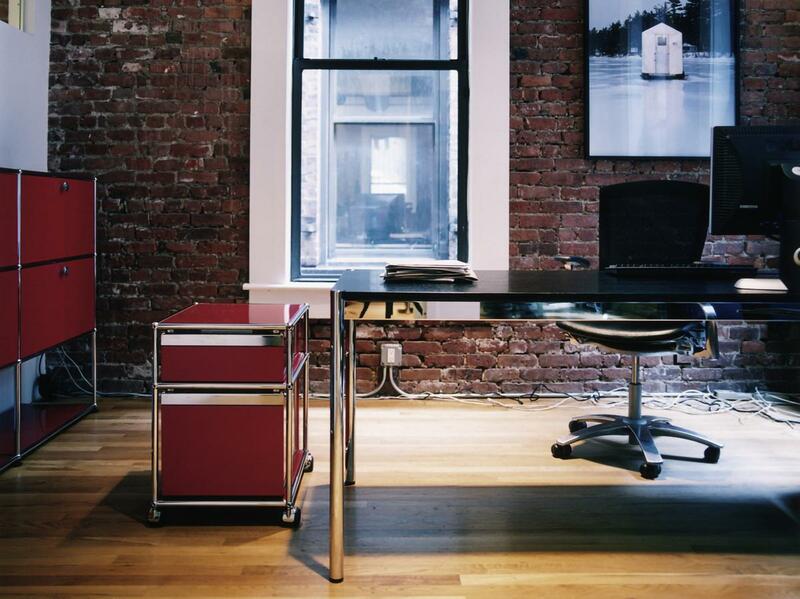 The reduced design of the USM furniture is timeless and universally applicable.